During the summer months there is often an increase in cycle thefts both out and about and from private property. Crewe & Nantwich has a high number of cyclists due to the flat layout of the towns and is therefore an appealing place for would be bike thieves. Make sure that you steer clear of bicycle by taking a few precautions and being mindful of where you leave your bike. Remember it can happen to you! Invest in a good quality bike lock and use it every time you leave your bike unattended. Try to secure it in a busy area where passers by would notice if someone was trying to steal it. Never leave your bike propped up outside your house or the front of a shop even if you are only going to be a very short time. Over half of bikes are stolen from the owner’s property as people will often leave their bike in the back yard presuming it will be safe as it is in the grounds of their property. Ensure that you lock your bike up when it is in your garden either with a bike lock, in the shed or garage or both. If your bike is particularly expensive consider extending your home insurance policy to cover it. Consider security marking your bicycle. Systems usually include a visible sticker to inform potential thieves that the bike is marked making it less valuable. It also means that if your bike is stolen and recovered by the police they can identify the bicycle and return it to its rightful owner. People in Crewe are being warned to take more care about locking up. In two days five burglaries were reported where the criminal simply walked in through an unlocked door. Most of the break-ins were carried out overnight. Detective Sergeant Andy McGillan said, “We are doing everything we can to track down and arrest burglars but people must accept some responsibility for the security of their homes. “Checking that doors and windows are locked should be part of everyone’s routine before going to bed. It only takes a few minutes. “We also advise people to keep outside doors locked at all times, even when they are at home and in a downstairs room. Criminals who specialise in sneak-in burglaries can be into a kitchen or hallway, take a purse or bag and be out again in seconds. Police have also asked people to keep an eye open for anyone acting suspiciously. “A sneak-in burglar will obviously move around trying doors until he finds one that is not locked,” said Andy McGillan. “If you spot anyone moving in and out of driveways or gardens and generally acting suspiciously call the Cheshire Police Information Line 0845 458 0000 and let us know. If you have any information about these burglaries you can use the same number, or leave information anonymously on Crimestoppers, 0800 555 111. The demolition team have moved in to the Lion and Swan pub on the corner of Underwood Lane West St. The pub has been empty for some time and was burnt down last year. Its not clear what is going in its place buts flats are the best bet. The West St improvements have been put back until 1st June. Lots of locals are complaining about the improvements as they say it will attract yobs. As part of the revamp they are putting in seats, new car parks and new pavements. You have to agree with the traders that the seats will attract gangs drinking even though its a no go area for booze. The problem is yobs are ruling the town decant people cant have a seat to rest on in case of yobs, Derby Docks trees had to be cut back because of drunken parties. Were does it all end? It ends when the Police take action against these people. We had a meeting on Friday with Mike Taylor, Crewe Mayor Dorothy Flude, Elaine Dodd and Cllr Andrew Knowles and Crewe Blog at Tipkinder to promote the site and get improvements done. Everyone was surprised by the area and the potential it has situated so near the the Queens Park. So many people go the Queens Park and don't even know the walk if a few feet away. Everyone agreed that the site wanted promoting and there was work to be done in the area and it should start straight away. The paths will be cleared and the rubbish removed as soon as possible and the trees made safe. It was a timely meeting as the next day a massive tree collapsed in the area I am sure that will be dealt with ASAP. The long term plans depend on several issues like funding and consulting with all interested parties like local residents. Its not a simple matter to manage the area as new trees want planting, old trees felled or pruned and new plants to encourage wild life into the area. Its hoped the Countryside Rangers can be appointed to look after the site as they can do weekly inspection advise members of the public etc. The car park which is used when going to the Queens Park will be revamped and traffic lights installed to make it safer for children to cross the road. As I was by the square today the new trees arrived from a specialist supplier of mature trees and they were planted straight away. I talked with a lot of people watching and everyone I spoke to was complaining about the waste of money. To move the Memorial and then spend a lot of money putting down a pavement which looks like kitchen tiles with a few trees was stupid and a waste was most peoples comments. The trees will restrict the size of anything going onto the square like the bouncy castle as they are near the middle so there is a not a single large center. The new Heart shop next to Asda is well under way and should be open soon. Its a very big shop to fill but its going to be for furniture and electrical goods. They still have the smaller shop around the corner. Crewe and many other places seem to have more charity shops than anything else. Charity shops are becoming big business and seem to flourish were normal shops fail. As they get their goods free they must be able make a profit. There is a new twist to the tale as people over 16 who are out of work must now go on a coarse for 6 months for which they get £15 a week. As part of the coarse they are supposed to be helped into work with work experience. What is happening now is every charity shop is taking these kids on for free. Yes they do get some experience of work but it most cases its very menial. I went up Minshull New Rd the other week and watched the community speed camera guy catching motorist speeding outside the school. When caught they get a letter to advise them of the speed and they are not normally charged unless the speed was excessive. I did see one going fast and the Police officer tried to stop him but he nearly ran her over and floored it. I have no doubt he will be caught given they have his registration number. This week they have this nice little speed trap which shows your speed, they have big ones on many roads but this is a tiny portable one that can be picked up and moved. We don't advertise on the blog but we do support new ventures in Crewe. 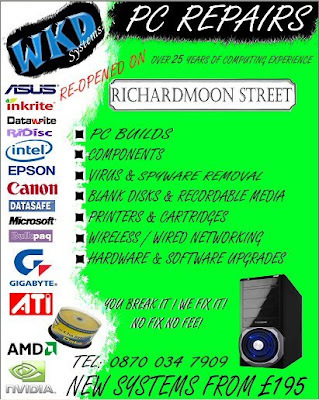 This week a much needed new computer shop opened in Richardmoon St. Crewe has been short on computer shops as there are really only the major stores who don't do repairs or custom pc's. To get an idea of what could be done I walked over the road from Tipkinder down over the golf coarse to the other woodland area that goes down as far as the Rising Sun. It does show what can be achieved. The first thing that hits you is people have dumped rubbish in the stream spoiling it for everyone (another job for Caroline) but you all ways get that. They have even got a map of the area showing points of interest and wild life so you know what to look for. It hits the right balance of being well kept and walkable but keeping the right balance with wild life and nature. So with this path you could start at the Rising Sun and walk all the way to town via Tipkinder and Valley Park barley touching a street. Tipkinder Woodland Walk Anyone seen the tree fella? Anyone seen the tree fella? Take a look at the picture of the Tipkinder woodland walk then scroll down to the picture taken a week ago notice anything? You will see that Caroline has got the big whip out and got the Grounds Maintenance out rapidly and they have felled 3 dead poplars along the path towards the car park end. We have been highlighting the Tipkinder area along with Crewe Blog who has a video of the area on the blog. We have asked Cllrs Roy Cartlidge, Dorothy Flude, Andrew Knowles, Brian Silvester to help improve the area. What’s needed Short term for this summer? 1 The main path cleared of nettles and brambles and kept that way. 3 Any dead and dangerous trees made safe. Caroline Yoxall Cleansing Supervisor Cheshire East Council and the Probation Service have moved quickly and the Probation Service is to clear the paths and remove the rubbish from the river, and Caroline has got the council to inspect the trees. So there is progress already. Both Groundwork Cheshire and the local Valley Brook Residents Association (the “river” in the pictures is called Valley Brook locally) had drawn up plans for possible footpath and other improvements adjacent to the riverside including removal of overgrown areas and more appropriate tree and shrub planting schemes. Unfortunately in lieu of being able to identify the necessary funding, these plans have never to date been implemented. 1 The path by the stream cleared so it’s usable and strengthen the bank. 2 Other paths in the area cleared. 5 Proper paths made of gravel like the have done the other side of the golf coarse were there is a nature trail. 6 Better planting in keeping with the area to make it a spectacular walk. 8 Other suggestions for the bottom field to fit in with the BMX and SK8 parks. 9 The big one connect Tipkinder to Queens Park via a bridge as its not safe crossing the road this would in effect extend the park. Funding anyone got any money? How much will all this cost? Well not very much most of it is down to man power in any shape or form ie Probation Services, Volunteers, Unemployed Schemes, Council workers. Really that’s all that’s needed for most of it the only cost would be planting of new shrubs and gravel for the paths. I bet places like Bridgemere Garden Center would cough up the plants if they get an advert? There is the big answer Reaseheath College I used to be a head gardener at a 32 acre site with woods and the college who have 1,000 of student studying trees, country side, propagation etc jumped at the chance to get their student down to learn in a real work environment and they have all the expertise to do a fantastic job maybe for free? I mentioned this and the old H&S came into the conversation well as the college is one of the top in the UK they know more about H&S than most. While they are at Tipkinder why don’t they get involved in the Queens Park designing new beds, tree management etc lets get the job done? It cost nowt to ask them and the publicity for all is just what is needed for the promotion of the area. The Tipkinder Project could bring people in for miles around and be used for schools etc so who will take ownership of this project and run with it Who will make it happen? A rare site over at the Heritage Centre with the Giants of Steam visiting Crewe. The public display of the newly restored ‘Royal Scot' alongside ‘Duchess of Sutherland' and ‘Princess Elizabeth' means that for the first time since 1962 fully operational examples of each of these legendry classes of the steam age have been seen together. It was a good day out but not as many people there as I would expect considering the attractions but there were a lot of old boiler makers talking about he old day when my Grandfather Joe Barnshaw was a boilermaker. It takes you back to the good old days when I was a child and used to go and watch the old steam trains every week.